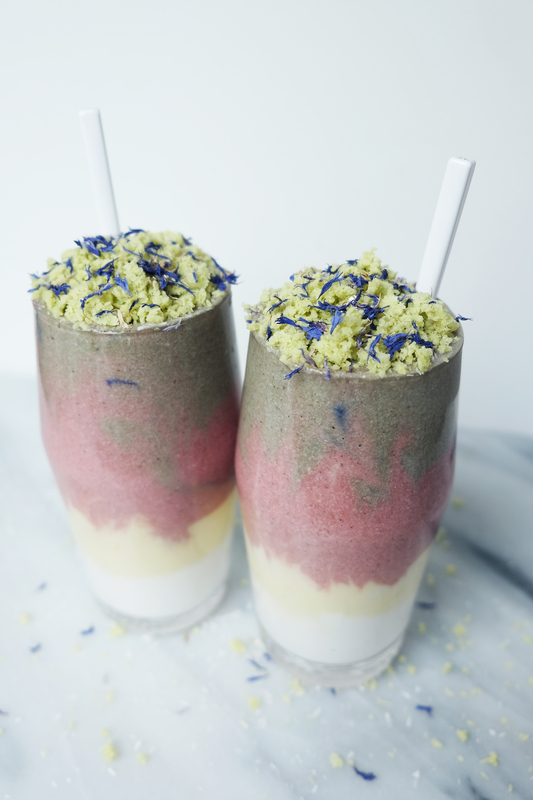 I created this recipe a while back and have been dying to share it with you guys! 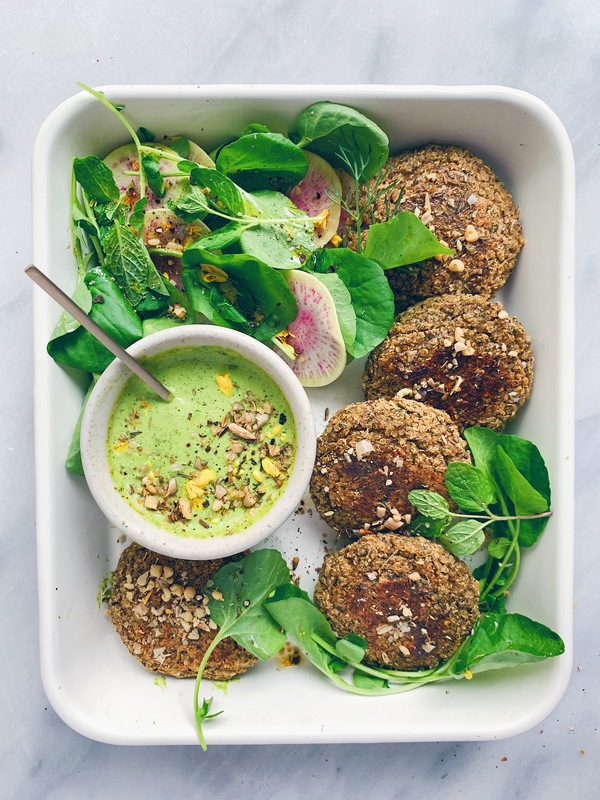 These Baked Quinoa Patties with Herbed Tahini Sauce are a weekly staple at our haus. I love making a double batch to have extras in my fridge for easy lunches during the week. The sauce can also be used as a dressing for your favorite salads or a dip for your next snack platter. I originally made these into quinoa balls, but they work great as patties too. Feel free to swap out the dill for any other herb you like, and same goes with the herbs in the sauce. 1.) Preheat oven to 450°F. 2.) Heat one cup quinoa and a little less than 2 cups of water in a small saucepan over medium-high heat. Bring to a boil. Once boiling, turn heat down to low and cover the pan with a lid. Cook quinoa for 15-18 minutes. Once done, fluff with a fork, transfer to a bowl and let cool completely. 3.) In a small bowl, whisk together ground flaxseed and ½ cup water with a fork and let sit at least 5 minutes. 4.) Once cooked quinoa is cooled, add all ingredients except water to a food processor. Process for a minute or so then slowly add the 1/2 cup water while the machine is running and process into a sticky ‘dough’. 5.) Working a ¼ cup at a time, form dough into 12 small round patties. Alternatively, you could roll into balls. 6.) Place patties or balls on a parchment lined baking sheet and bake for 15-18 minutes, flipping halfway. 7.) While the quinoa patties are baking, make the herbed tahini sauce. Add all ingredients to a high-speed blender and blend until very smooth (1-2 minutes). 8.) 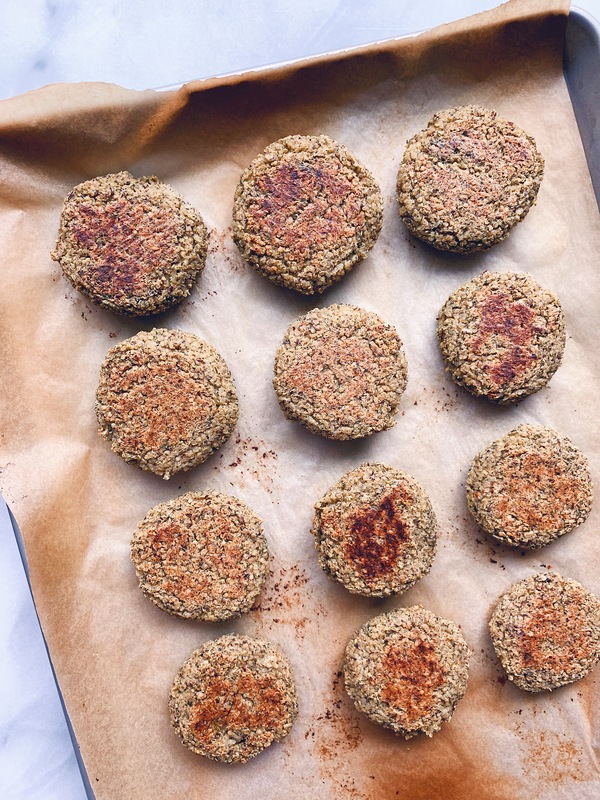 Serve quinoa patties with salad greens, any other desired veggies and herbed tahini sauce. Enjoy! 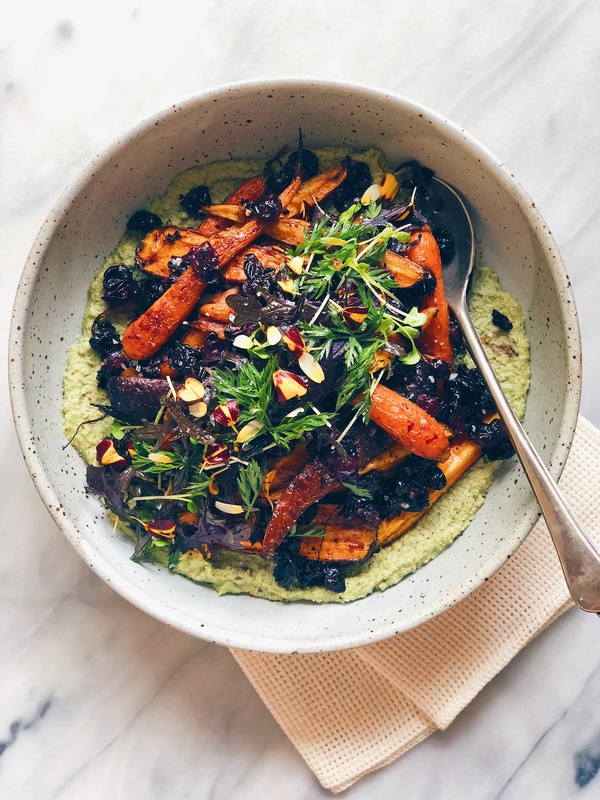 Seriously loving this combination of roasted carrots and grapes with pumpkin seed thyme hummus. I’ve been really into roasting grapes this fall and pretty much using them on anything and everything. 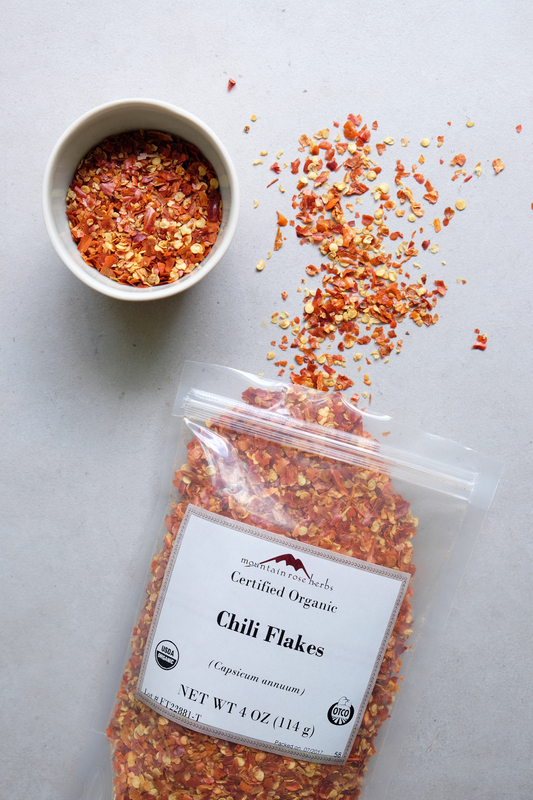 They’re perfect for serving on top of bread, adding to your favorite fall salad, using on a yogurt bowl, you name it! The pumpkin seed thyme hummus is creamy and herbaceous. This whole dish feels very grounding and nutritious, exactly what I want from a fall dish. A great one to make for dinner or as a side dish when dining with family or friends. Enjoy! 1.) Preheat oven to 425°F. Roast carrots for 40-45 minutes or until golden and tender. 1.) Preheat oven to 425°F. 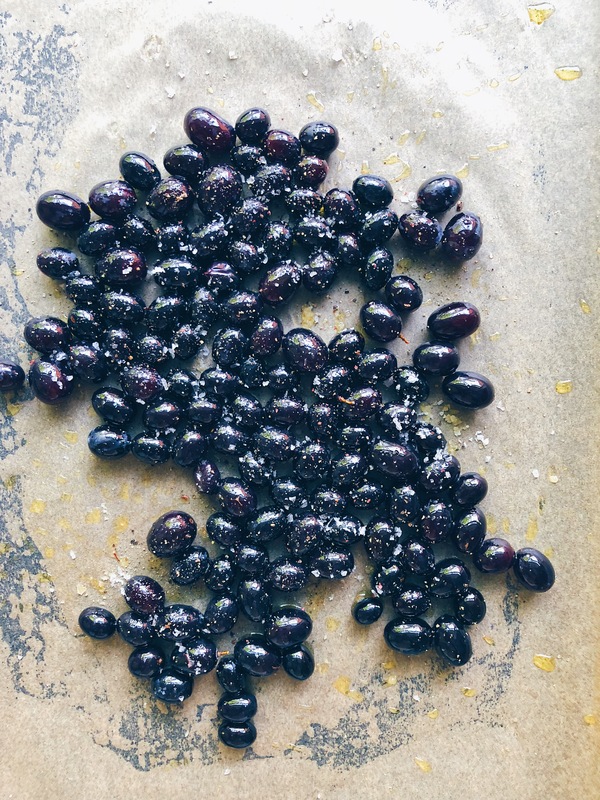 On a parchment lined sheet pan, roast grapes for 20-25 minutes, stirring 2-3 times through cooking. 1.) In a food processor, blend all ingredients until very smooth, about 5 minutes. 1.) In a large serving dish, using a large spoon or rubber spatula, spread the pumpkin seed hummus down in an even layer about 1/2″ thick. 2.) Layer carrots down on top of pumpkin seed hummus then top with the roasted grapes. Garnish with fresh greens, salt and pepper. Serve with balsamic vinegar on the table. Enjoy! There’s nothing quite like the aroma of freshly baked fall-spiced muffins filling up my haus. Warm and comforting. A treat without being overly sweet. You can play around with which fruit and spices you add. You could also use hazelnuts or another kind of nut instead of walnuts. I used the gorgeous pink-fleshed Mountain Rose apples that I found locally here in Portland. If you can’t find those, I would recommend honey crisp or pink lady. 1.) Preheat oven to 350°F. 2.) In a large mixing bowl, whisk together wet ingredients until well combined. In a medium bowl, whisk together dry ingredients until well combined. 3.) Slowly add dry ingredients into wet ingredients, using a rubber spatula to mix under dough is formed. If dough is looking too dry, you can add a couple Tablespoons more nut milk. Fold in the diced apple. 4.) 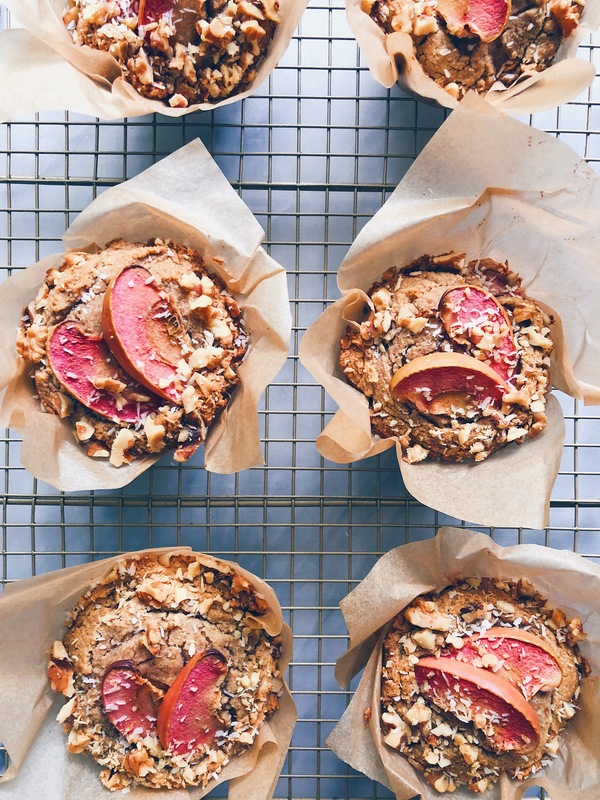 Line a muffin tin with parchment paper or simply grease with coconut or olive oil. Fill each muffin about 3/4 of the way full. Top with apple slices and chopped walnuts. You guys!!! 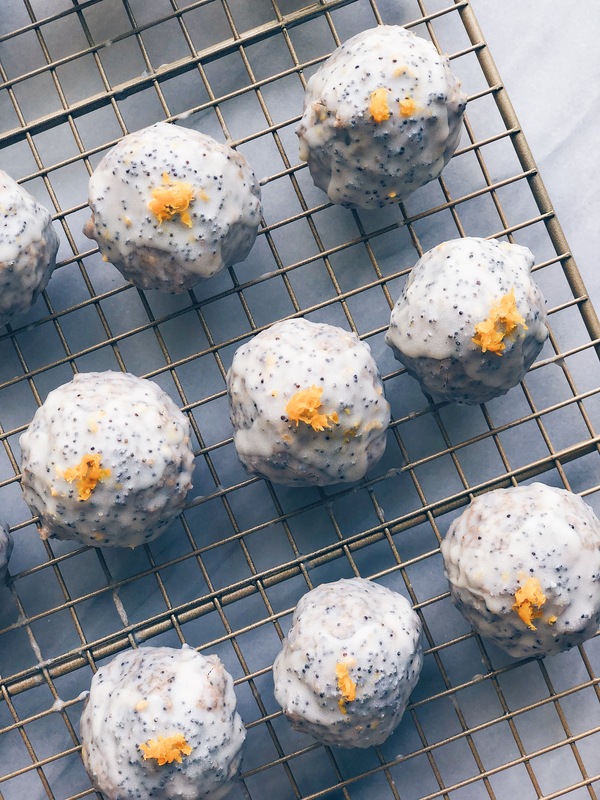 These No-Bake Lemon Poppy Seed Glazed Donut Holes are seriously a dream come true. After I made them this morning, I gave one to my husband. 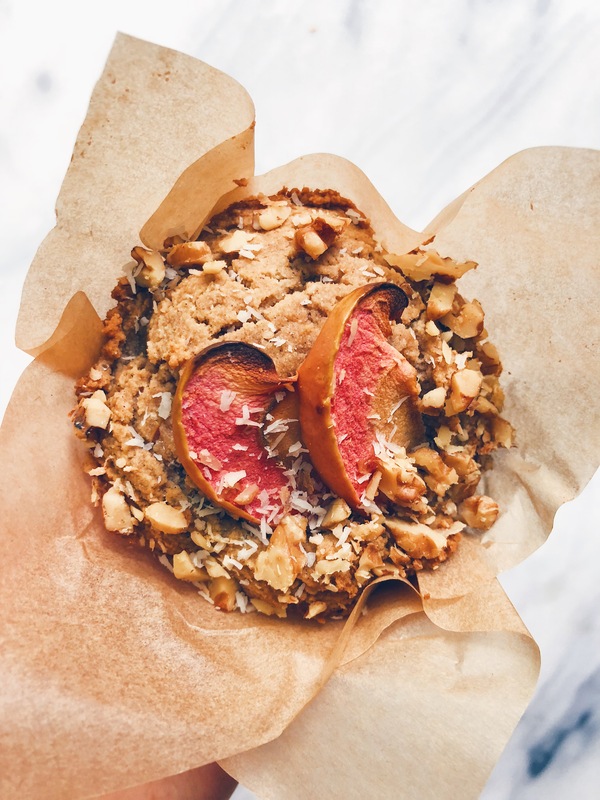 He took a bite and said, “This is why I love you.” These little snacks are sweetened with dried unsweetened and unsulfured apricots and a small amount of coconut nectar. The base is made with gluten-free oats and walnuts. 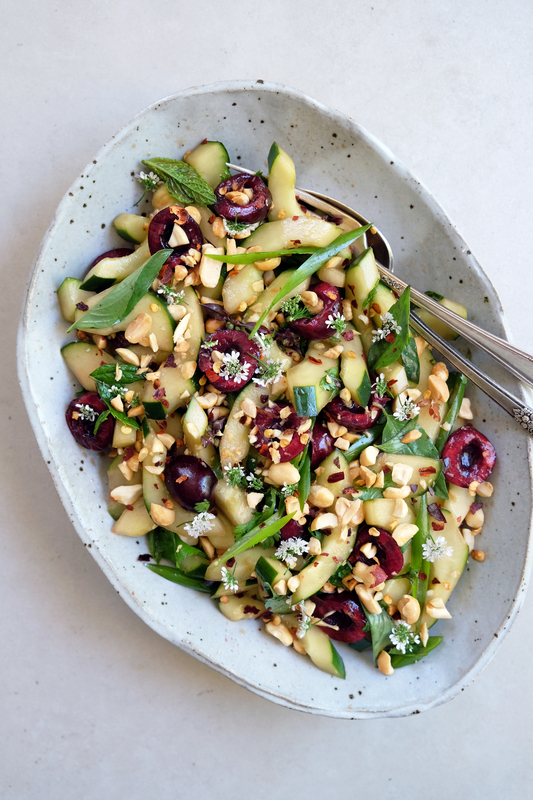 If you don’t do walnuts, you could try subbing soaked sunflower seeds. I haven’t tried this substitution, so if you do, I’d love to hear how they turn out. 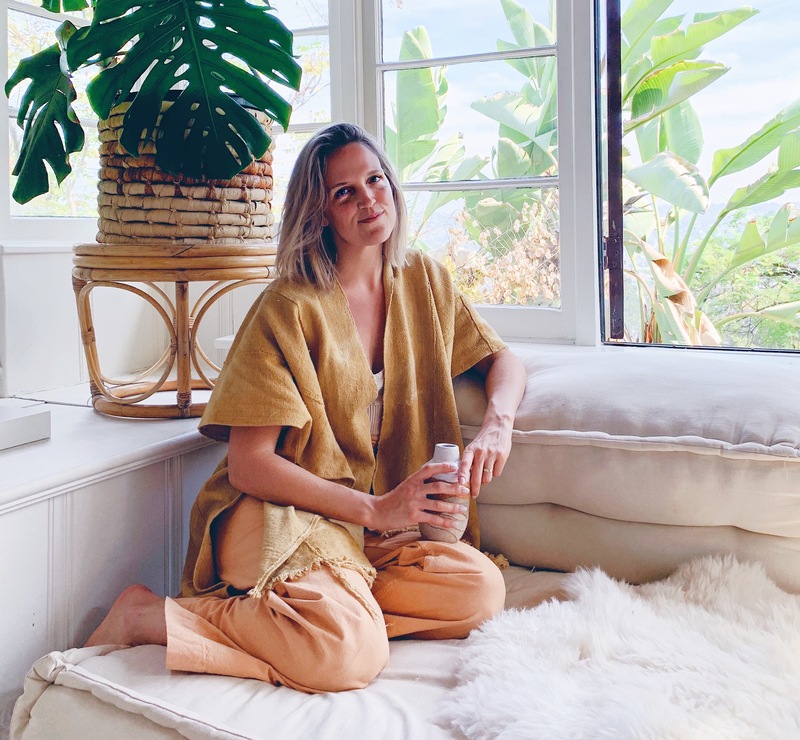 I seriously love how many amazing products I can get from Mountain Rose Herbs. I love stocking my pantry and spice cabinet with their bulk goods. The vanilla bean powder in these donuts is definitely a splurge (and I think a worthy one), but the recipe works great with vanilla extract as well. Enjoy! 1.) 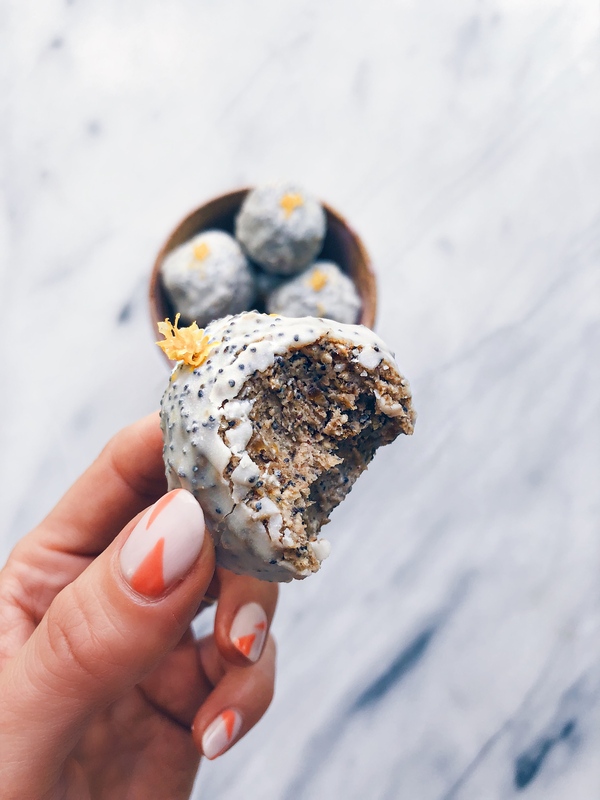 Add all donut ingredients except poppy seeds to a food processor and process until dough forms and all ingredients are well mixed. Add the poppy seeds and pulse a few times until well combined. Dough will be wet and sticky. 2.) 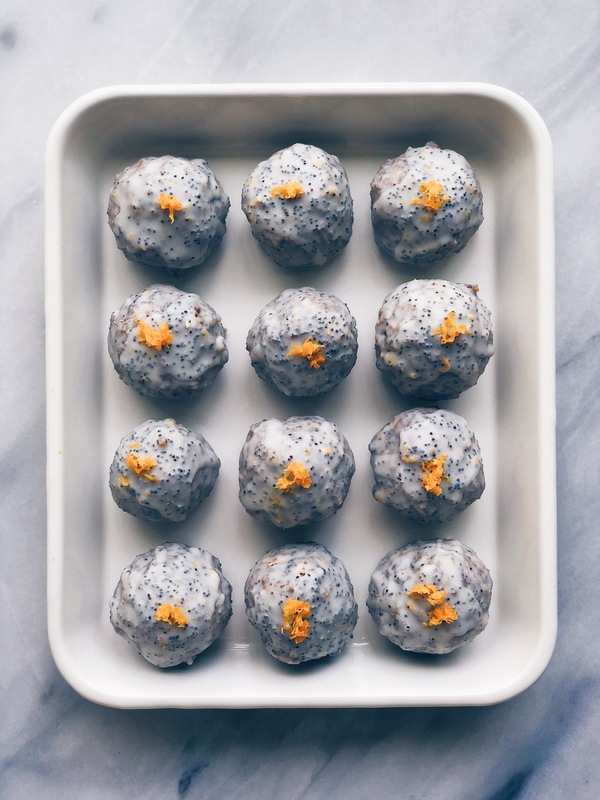 Form into about 16 balls of about 1 Tablespoon each. Place on a parchment paper lined tray and freeze for about an hour until firm. 3.) Once the balls are firm and chilled, make the glaze. 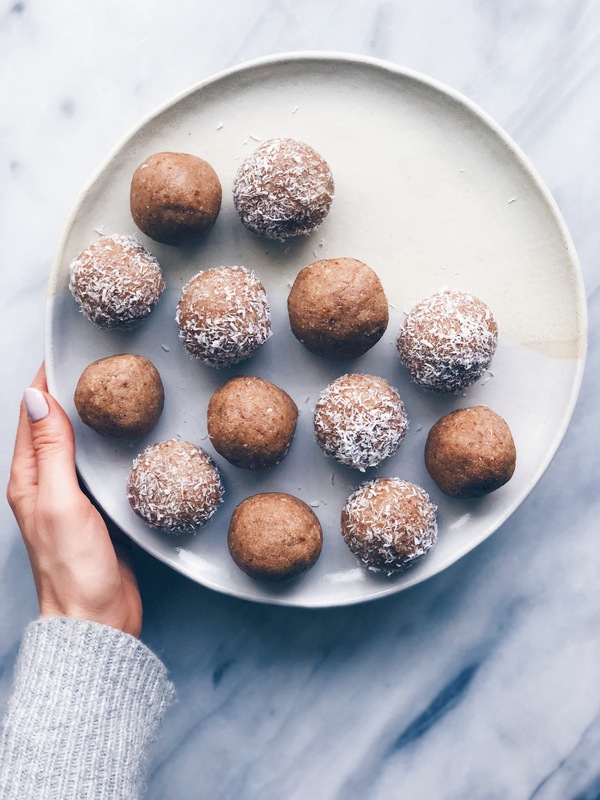 Place a smaller bowl into a large bowl of hot/just boiled water to melt the coconut oil and butter and to keep everything liquified as you glaze the donuts. Add all ingredients to the smaller bowl and whisk until smooth. Dunk each donut in the glaze and roll until fully coated and return to the parchment-lined tray. The glaze should harden almost immediately since the donuts will be cold from the freezer. If the glaze doesn’t harden because you are in a warm climate, place the tray back into the freezer to harden. My annual cookie recipe is here! I’m not much of a baker, but the holidays always spark some creativity in me. See last year’s cookies, here. 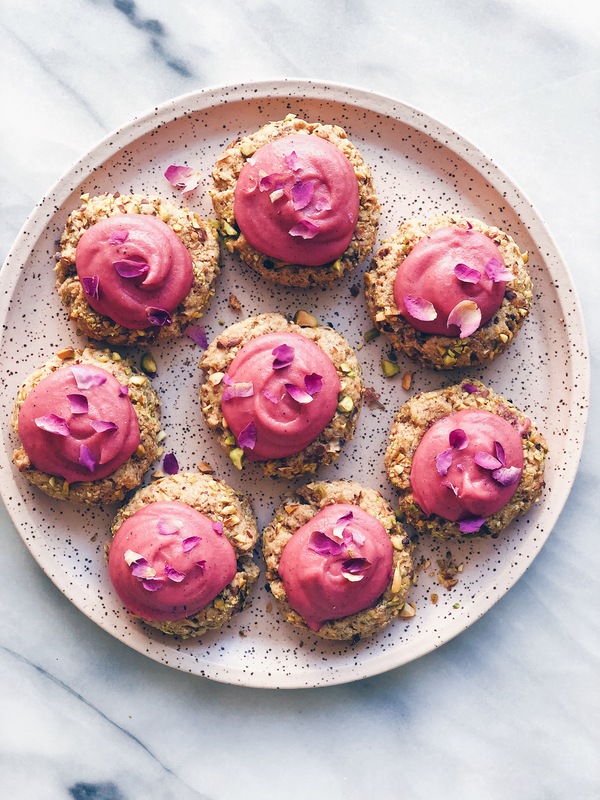 These grain-free, vegan Pistachio Thumbprint Cookies with Rose Cashew Cream are inspired by this recipe from the December issue of Bon Appetit. 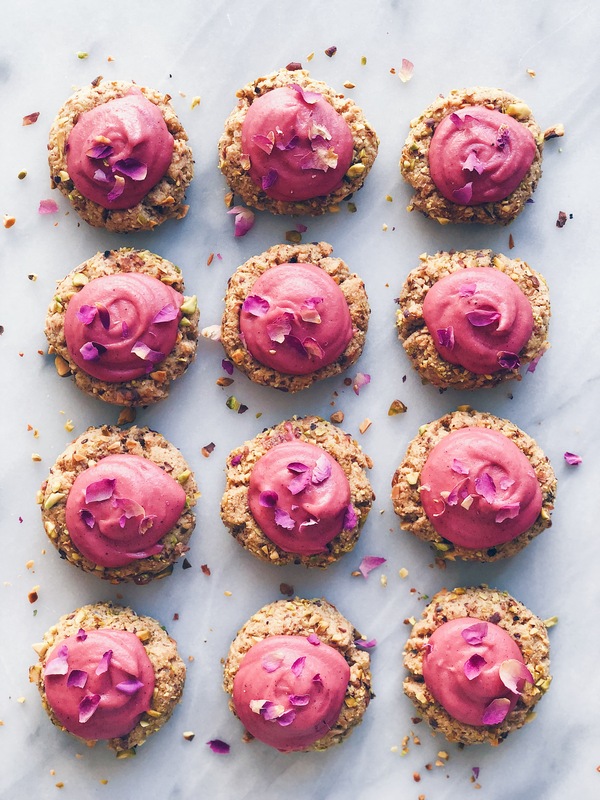 I wanted to create a healthier version of BA’s recipe and add rose because pistachio-rose is one of my favorite classic flavor combinations. These cookies are SO easy to make, they’re insanely beautiful and they’re soft and pillowy like a cloud. The perfect addition to any holiday dessert spread. I could also see making these year round because they’re that good. 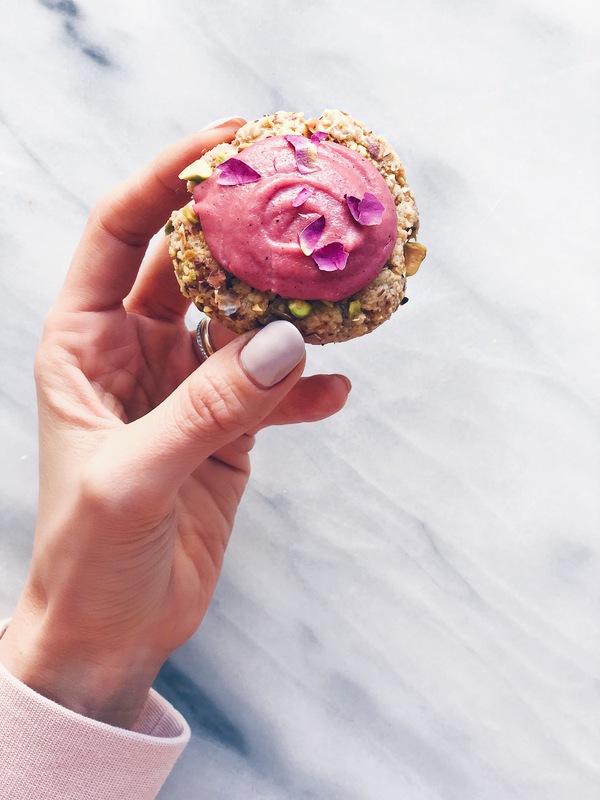 If you aren’t crazy about the rose flavor, you could try using almond or peppermint extract in the cashew cream to switch it up. 1.) Preheat oven to 350°. Combine all ingredients except pistachios in a food processor and process until well-combined. Dough should be sticky and feel slightly greasy. 2.) Roll dough into 24 1-inch balls. Roll in the chopped pistachios, and place on 2 cookie sheets lined with parchment paper. Using your thumb, make an indentation about 3/4 of the way down into the center of each cookie. You might want to reform the edges of the cookies if any cracks form. 3.) Bake cookies in preheated oven for about 12-15 minutes. Be careful not to over bake, as the cookies will be too dry if left in the oven too long. 5.) When the cookies are done baking, carefully transfer cookies to a wire cooling rack. Let sit for about 15-20 minutes or so until completely cool. Using a spoon, dollop some of the cashew cream into the thumbprint of each cookie. Top with dried rose petals, if using. Store in the refrigerator in an airtight container for up to a week. 1.) Process all ingredients in food processor until a sticky dough forms. 2.) Gently roll into small round balls. 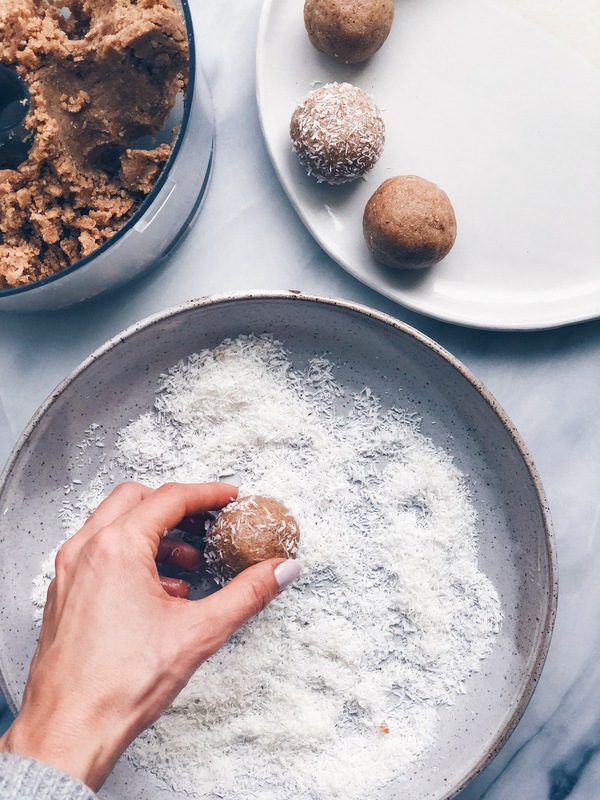 Roll balls in dried coconut, chopped nuts or any other desired add-in. Enjoy! They’re here!!! 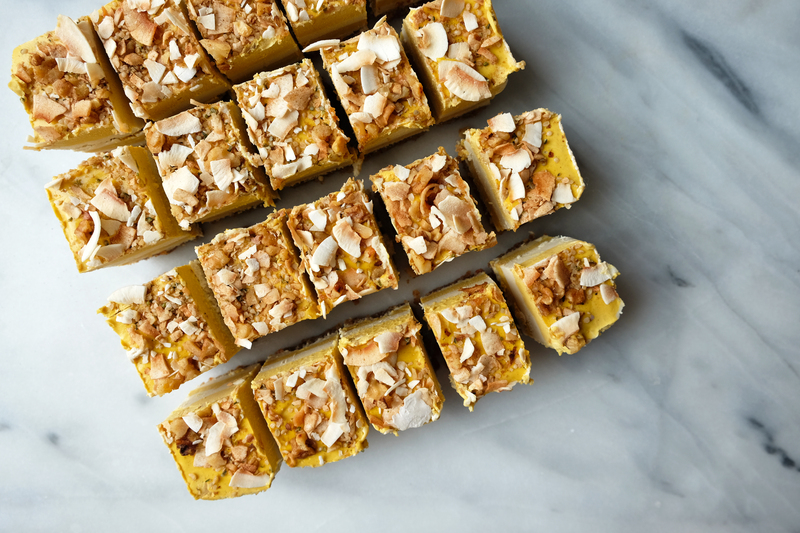 PUMPKIN PIE DREAM BARS! 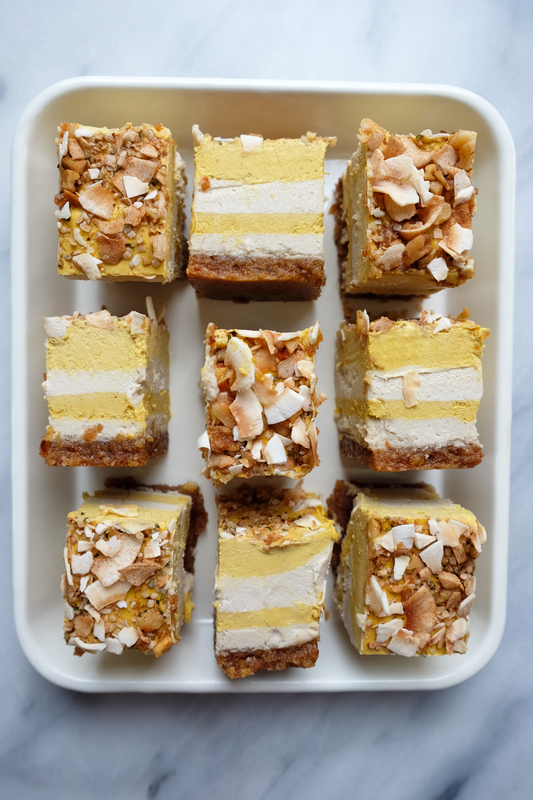 The autumnal follow up to my Pastel Coconut Cashew Dream Bars from the spring. And you guys, these babies are seriously to die for. I may like them even more than the originals. They’re like a cloud of pumpkin pie perfection. Definitely making these for Thanksgiving and Christmas. I hope you love them as much as I do! To make topping simply mix all ingredients together in a small bowl and set aside. 1.) In a food processor, blend the walnuts and brazil nuts into small pieces. Add the dates and salt and blend into a sticky dough. 2.) Line an 8×8 square pan with a strip of parchment paper or plastic wrap (this makes removing the bars from the pan easier). Press the mixture into the bottom of the pan evenly to create your crust. Transfer to the freezer while you make the vanilla and pumpkin layers. 3.) Drain and rinse the soaked cashews. 4.) *Make the vanilla layer: add all ingredients to a blender and blend on high for about 2 minutes until smooth. If you want to use even amounts of vanilla and pumpkin filling, measure out 1 cup of the vanilla layer and use a rubber spatula to spread the vanilla layer on top of your crust (if you do not care about having even layers of vanilla and pumpkin, simply spread all of the vanilla filling on top of the crust). Transfer back to the freezer to set for about an hour. 5.) Make the pumpkin layer: add all ingredients to a blender and blend on high about 2 minutes until smooth. If you want even layers of vanilla and pumpkin filling, measure out 1 cup of the pumpkin filling and use a rubber spatula to spread it on top of the vanilla layer (if you do not care about having even layers of vanilla and pumpkin, simply spread all of the pumpkin filling on top of the vanilla layer). Transfer back to the freezer to set for another hour alternating between layers. Once final layer in complete, sprinkle generously with topping and lightly press topping into filling. Transfer back to the freezer, and allow bars to set for 2-3 hours. 6.) Remove from freezer. Using the parchment paper or plastic wrap, pull up on both sides at the same time to remove from the pan. Using a sharp knife, cut into 2’’ x 2’’ squares. Bars will keep in the refrigerator for 3-5 days or in the freezer for a month. If you didn’t use lecithin, I recommend storing in the freezer. * Note: If you have two blenders, simply make the pumpkin layer in one blender and the vanilla layer in the other. 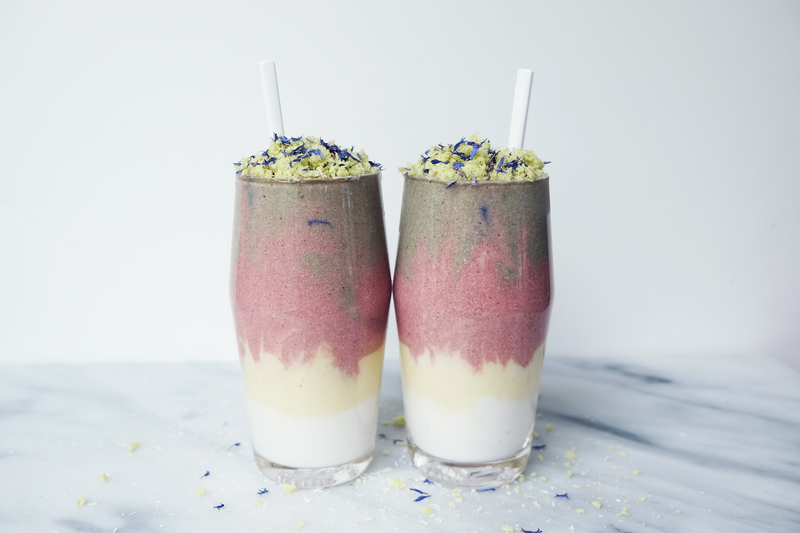 If you have one blender, make one layer at a time and rinse the blender between uses. Fresh herbs are my absolute favorite part about cooking. They’re what get me excited about being in the kitchen and creating new recipes. I never shy away from using them and playing around with combinations of herbs together. Mountain Rose Herbs is a wonderful resource for sourcing dried herbs in the off-seasons when fresh herbs may not be available. 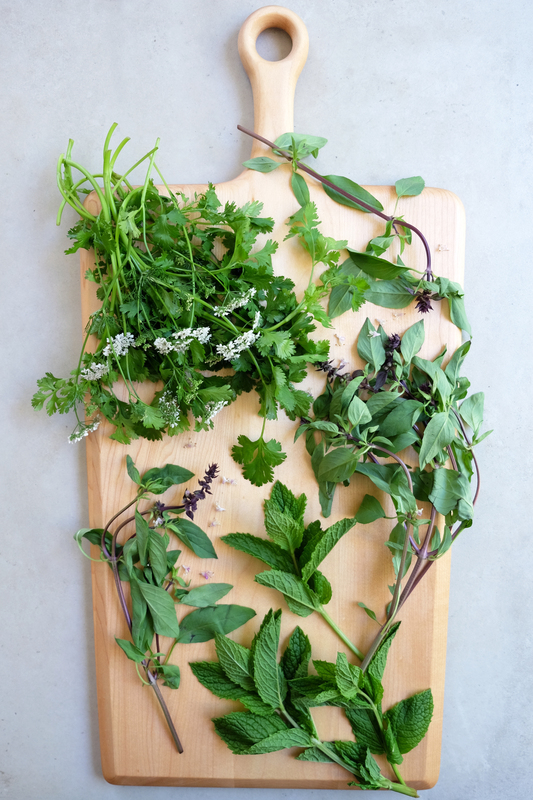 Basil, cilantro and mint are some of my favorite herbs for summer. They’re all versatile and work well on their own or combined together, like in the recipe below. 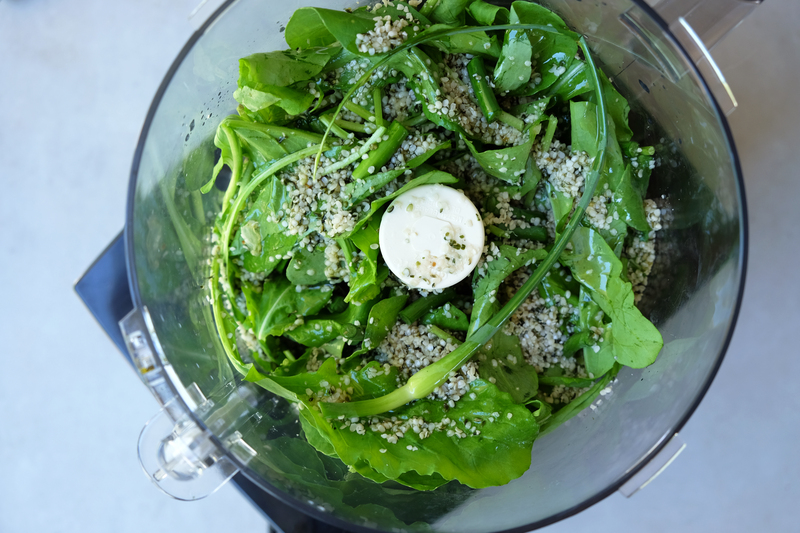 I love serving this salad over quinoa or your favorite variety of rice. This allows the dressing to be absorbed while making it a more hearty meal. I really do feel bad for people who have the cilantro-tastes-like-soap gene. For those of us who don’t have it, cilantro has a bright, citrusy flavor profile. It’s best used fresh. The seeds (coriander) are amazing in dukkah. Definitely one of my favorite herbs, both fresh and dried. Peppermint has a strong, cooling aftertaste while spearmint has a lighter and sweeter profile. Can be used in both sweet and savory preparations. Mint tea is one of my all-time favorite drinks. Can be made with fresh or dried leaf. 1.) Whisk together the dressing and combine with the cucumbers. Let marinate for 15-20 minutes. 2.) Meanwhile, prep all other ingredients. After cucumbers have marinated, toss with the other ingredients and serve. For a more hearty meal, serve salad over rice or quinoa. This breakfast toast is perfectly simple and tastes oh-so-freaking good! Topped with Manitoba Harvest Toasted Hemp Seeds for the ultimate savory crunch. This seasonal pesto features Manitoba Harvest Hemp Hearts, which give the pesto a creamy texture while adding 10-grams of protein for every 30-gram serving and all 10 essential amino acids. Hemp contains omega-3, omega-6, stearidonic acid (SDA) and the rare omega-6 Gamma Linolenic Acid (GLA). GLA has been shown to help with cholesterol, inflammation, skin and hair health, balancing hormones and general heart health. Not to mention, hemp is a dual-crop plant, meaning that both parts of the plant are used. The stalk in clothing fiber and textile applications, and the top where all the seeds are for hemp food products. It’s one of the most sustainable crops for farmers to grow. You can read more about hemp, here. 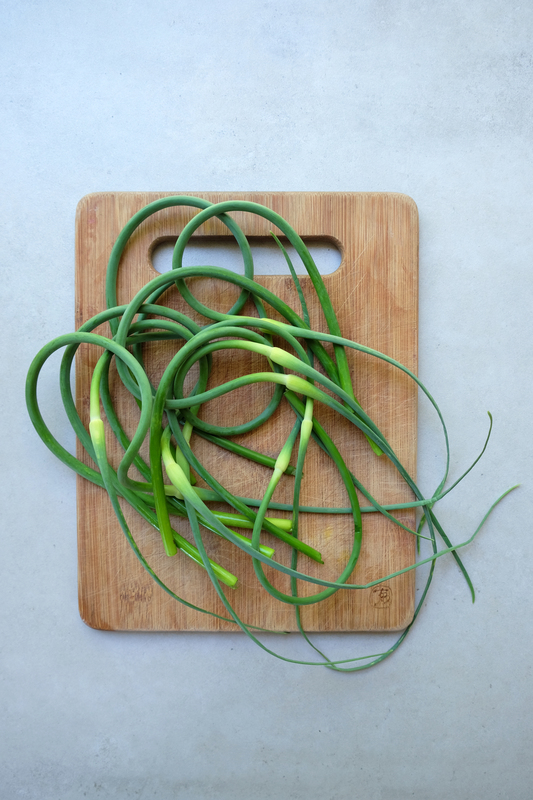 I’ve been loving garlic scapes this season. Pesto is probably my favorite way to use them, but they’re also amazing roasted and eaten as a side dish or on top of a quinoa veggie bowl. This is really embarrassing, but I finally got my first food processor in May, so needless-to-say my pesto game has really improved. No more blender pesto. Yay! 2.) 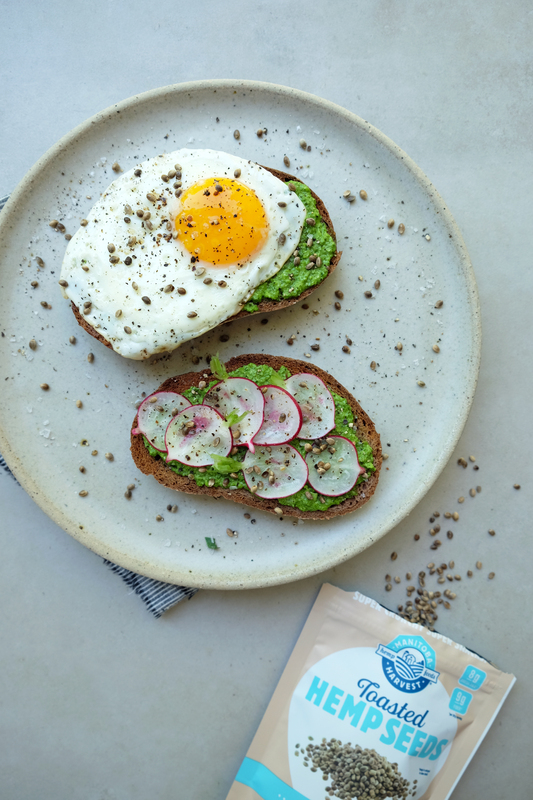 Assemble toasts by smearing toasted bread with pesto, top with fried egg and radishes. Sprinkle with Toasted Hemp Seeds, salt and pepper. Enjoy! 1.) In a food processor or high-speed blender, process garbanzo beans, yogurt, tahini, olive oil, garlic, lemon juice, salt and pepper until smooth. 2.) For the beet-thyme hummus, add 1/3 cup grated raw beet and 1 teaspoon fresh thyme. Process until smooth. 3.) For the herb hummus, add 1/3 cup full, 1/3 cup parsley and 1 Tablespoon extra virgin olive oil. Process until smooth. 4.) For the turmeric-pine nut hummus, add 1 teaspoon turmeric, 1 Tablespoon pine nuts, 1/2 teaspoon chili powder and 1 Tablespoon extra virgin olive oil. Process until smooth. 5.) Serve with your favorite veggies and crackers. Enjoy!